Looking for Assassin’s Creed 4 outfits, costumes and clothing items? The following Assassin’s Creed 4 outfits guide explains how to unlock them. We’ll help you get the most out of the Assassin’s Creed IV: Black Flag game on the Xbox 360, PS3, PC, Wii U, PS4 & Xbox One. Watch the video guides below to see all Assassin’s Creed 4 Unlockable Outfits. Tip: Outfits can be accessed and changed into via the mannequin in the Jackdaw ship’s captains cabin, as well as through any local general stores. Thanks to Ubisoft’s Uplay Rewards you can unlock Assassin’s Creed 4 outfits, as long as you play from the start of the game with your registered Uplay.com account signed in from the game’s Main Menu “Uplay” section. Then as you play through the game — completing Sequences 1, 6 & 13 in Singleplayer for 60 points and playing every game mode & using all multiplayer weapons for 40 more points — you’ll gain Uplay points on your account that you can spend in that same menu to unlock in-game outfits! And that’s how to unlock Assassin’s Creed 4 outfits, simple eh? The Vengeful Daughter Pack: Unlock the Multiplayer Lady Black’s Vengeful Daughter costume, and additional items for the Jackdaw. — Unlocks for: 40 Uplay Points. The Blades of Toledo Pack: Slay your enemies with the Blades of Toledo in Singleplayer, and unlock exclusive Multiplayer Profile items. — Unlocks for: 30 Uplay Points. Will you equip Edward with an authentic pirate costume, or strike fear into your enemies in Multiplayer with the Vengeful Daughter costume for Lady Black? Altaïr Ibn-La’Ahad Outfit: The Altaïr Ibn-La’Ahad robes are a nice homage to the original Assassin’s Creed game. “A light but durable outfit designed to the exact specifications of the Levantine Mentor’s original robes.” — How to unlock: On the system you’re playing on you have to have Uplay data from 1 prior Assassin’s Creed game. Brown Cloak: — How to unlock: Go to any general store and buy it for 1,500R. Connor Kenway Outfit: The Connor outfit is a throwback to Assassin’s Creed 3. “Through a little Animus trickery, we can get a good sense of what Edward might have looked like in the robes of his grandson, the Master Assassin, Ratonhnhake:ton, colloquially known as Connor.” — How to unlock: On the system you’re playing on you have to have Uplay data from 3 prior Assassin’s Creed games. Crimson Cloak Outfit: — How to unlock: Go to any general store and buy it for 3,000R. 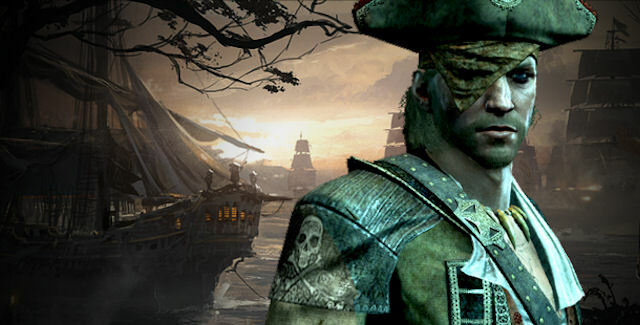 Default Outfit: The Captain Edward Kenway default outfit is your standard clothing. “Taken from the fallen Assassin, Duncan Walpole, these sleek robes have been heavily modified by Edward Kenway to better suit his purpose and personality.” — How to unlock: It’s available from the start of the game. Explorer Outfit: — How to unlock: It’s given out as a Community Challenge #6 reward. Ezio Auditore Outfit: The Ezio Auditore robes allow you to play Assassin’s Creed 4 in the Ezio outfit from Assassin’s Creed: Brotherhood. “Beautifully tailored robes that replicate the look and feel of the Italian Mentor’s robes.” — How to unlock: On the system you’re playing on you have to have Uplay data from 2 prior Assassin’s Creed games. Feline Pelt Outfit: — How to unlock: Go to any general store and buy 1 ocelot pelt & 1 jaguar pelt, or hunt & kill one of each of these animals yourself in the wild. Now open up the crafting menu, scroll to the very bottom and choose to craft this outfit. Governor Outfit: The Governor outfit is an easy to obtain alternate outfit. — How to unlock: Find a Social Treasure Chest. These are located on the map as a blue chest. Mayan Outfit: The Mayan outfit reflects bullet fired at you by enemies!! “According to legend, this Mayan outfit was created using scavenged First Civilization materials, and has the ability to deflect metal projectiles.” — How to unlock: By collecting the 16 Mayan Stones, which you can find out where they are in our Assassin’s Creed 4 Mayan Stela Locations Guide, is followed by opening up the secret door in Tulum (area unlocks after Sequence 4) where you can pick it up. Merchant Outfit: — How to unlock: Go to any general store and buy it for 10,000R. Officer Outfit: — How to unlock: Finish the “Gibraltar” Mission in Kenway’s Fleet. Pirate Captain Outfit: — How to unlock: Go to any general store and buy it for 8,000R. Pirate Cloak: — How to unlock: Go to any general store and buy it for 6,000R. Politician Outfit: — How to unlock: Go to any general store and buy it for 12,000R. Privateer Outfit: — How to unlock: Go to any general store and buy it for 5,000R. Shark-Hunter Outfit: — How to unlock: Go to any general store and buy 1 bull shark skin & 1 hammerhead shark bone, or hunt & kill one of each of these animals yourself in the wild. Now open up the crafting menu, scroll to the very bottom and choose to craft this outfit. Stealth Outfit: It considerably reduces guards’ rate of detection! — How to unlock: Finish half the Assassin Contracts in the game. Templar Outfit: The Templar armor reduces damage taken by 25%. A nice trophy to have from an encounter with the Assassin’s archenemy. — How to unlock: By collecting (mine)keys from finishing each of the 16 Templar Hunt missions, followed by opening up the cage in the Great Inagua hideout where you can pick it up. Whaler Outfit: — How to unlock: Go to any general store and buy 3 white whale skins, or hunt & kill three of this animal yourself in the wild. Now open up the crafting menu, scroll to the very bottom and choose to craft this outfit. Captain Morgan’s Outfit: The Captain Morgan costume is a pre-order bonus DLC. — How to unlock: It’s part of a GameStop-exclusive pre-order bonus called “The Black Island Pack”, that comes with Captain Morgan’s Outfit, Picture, Title, and Silver Flintlock Pistols. It’s possible this multiplayer skin will become available as paid DLC sometime after launch. Stede Bonnet’s Outfits Outfit: Stede Bonnet’s costumes are a pre-order bonus DLC. — How to unlock: It’s part of an Amazon-exclusive pre-order bonus called “The Hidden Mystery Pack”, that comes with Stede Bonnet’s Outfits, and other valuable Multiplayer Items. It’s possible this multiplayer skin will become available as paid DLC sometime after launch. Thanks to Mike, Ubisoft, Powerpyx, NapalmJuice, IGN & Nick for the tips and outfit videos. Do you know of any more Assassin’s Creed 4 outfits? If so, please leave a comment with a the tip for how to get it. We’ll update this outfits page and give you credit for the discovery!